This entry was posted on February 22, 2018 at 8:28 pm and is filed under 1980s, Heavy Metal, Heavy Metal and the 1980s, Music, Rock, Uncategorized with tags Americans, Armoured Saint, Classic Rock, Donington Festival, hard rock, Heavy Metal, Heavy Rock, Kill 'Em All, Metallica, MTV, Ride The Lightning, Rock And Roll Children, speed metal, The 1980s, Thrash Metal, WASP. You can follow any responses to this entry through the RSS 2.0 feed. You can leave a response, or trackback from your own site. Yeah Babay! Ride the Lightning. That was the one that really did it for me. Fade to Black, Trapped Under Ice, Creeping Death what an album. All great tunes and yes, what an album! A classic. In our circle of friends our first introduction to Metallica was via a Music For Nations compilation or maybe a Metal Massacre album. We couldn’t wait for RTL to come out and it honestly blew us all away with its power and intensity. We lived in a small town at the time and no one seemed able to find a copy of Kill em All or we didn’t even know about that album yet. I lived in such a town. I heard of “Ride the Lightning” before I heard of “Kill’Em All.” It is a mindblowing album. Can’t go wrong! My favourite? MAYBE. I don’t hate on later Metallica like some fans do, so I’ll just mention here I love Load, probably even more than Black. I don’t hate later Metallica either, not even St Anger. Nothing wrong with Load or Black. 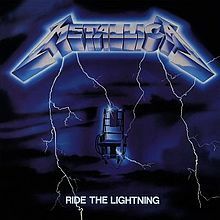 “Ride The Lightning” was the first Metallica album I heard! Their first three albums are masterpieces! “Creeping Death”, to me, is the best song on this album. To me, the “Black” album (which should’ve been titled “Don’t Tread On Me” because of the snake on the cover) is a good album. 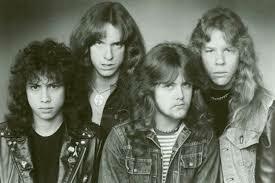 But Metallica went steadily downhill after Cliff Burton died! “St. Anger” made me saint-angry that I wasted money buying the CD! I heard so many people dis “St Anger” that I didn’t even bother. However, it is universally agreed that the first three Metallica albums are masterpieces. I like the “Black” album as well and I agree that they went downhill after that. Thanks, that’s why I could never understand why some people insist Metallica were a thrash band. Sure they had some thrash riffs but they were so much more. Thanks again for the re-blog, this is a great album! The golden age of THRASSSHHHH!!! Better late than never and in 1984, thrash was just getting off the ground.